Updating your profile only takes seconds and makes it easier for current and future collaborators to find you. 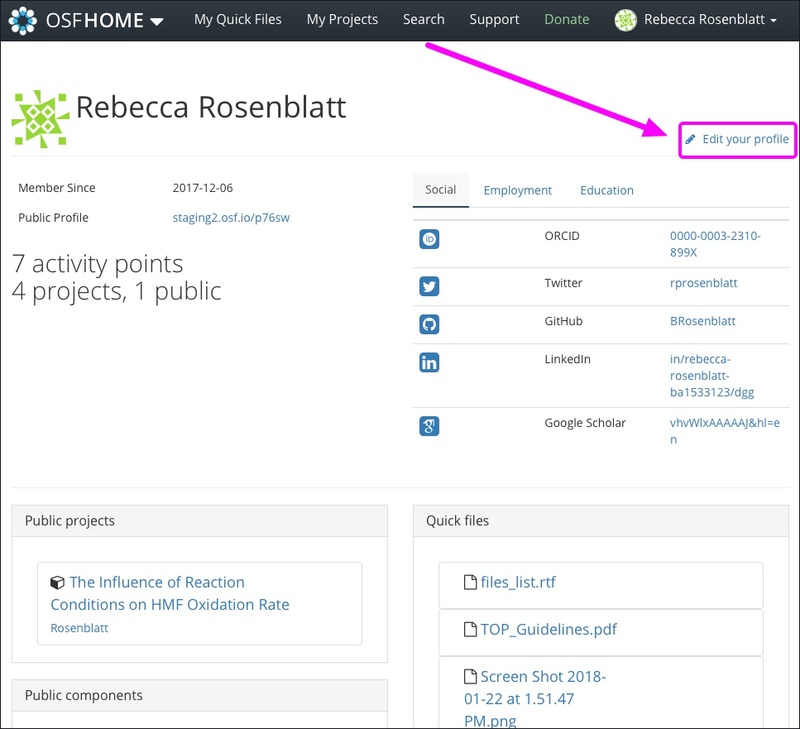 You can input social media profiles, employment, and education information so other researchers can more easily discover, share, and collaborate with you. Please note that this information is optional, and that you do not have to provide it. First, sign in to the OSF. Click your name in the navigation bar, then click My Profile from the drop-down menu. 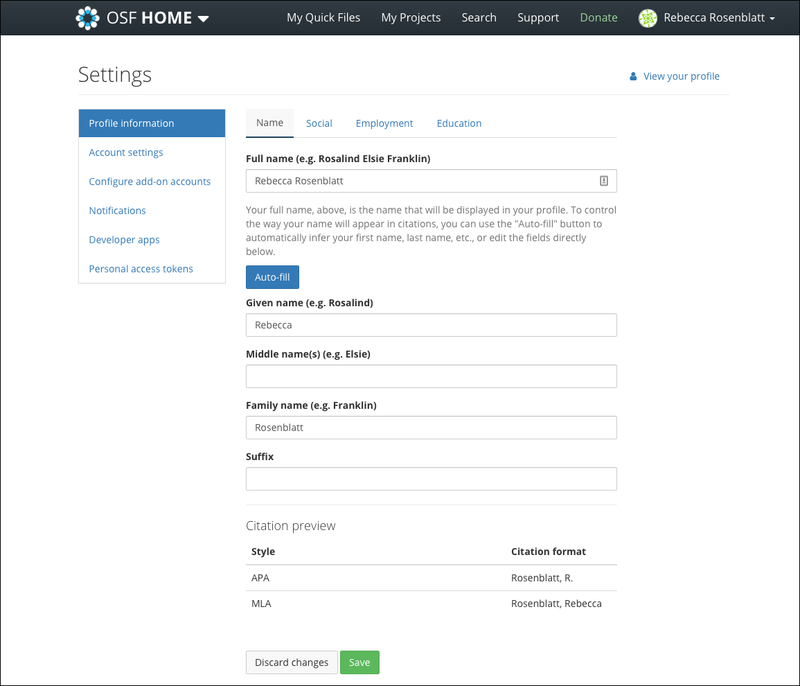 Your OSF profile will appear. 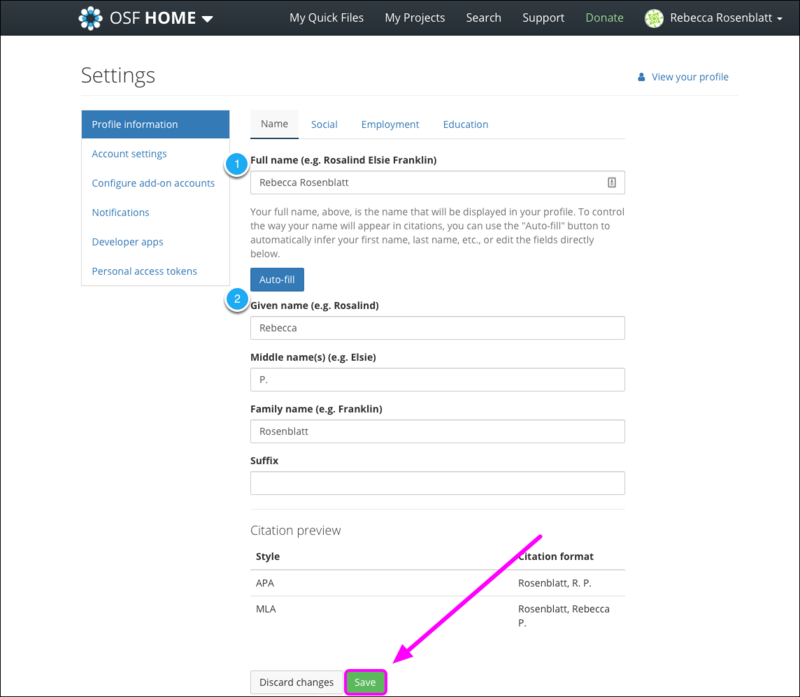 To edit your OSF profile, click the Edit your profile link in the top right of the page. The "Profile information" page will be automatically selected. The "Name" tab is open automatically when you navigate to your "Settings" page. Enter your full name in the first field. This is the name that will appear on your profile, in user searches, and on projects' contributor lists. Click the Auto-fill button to automatically populate the name fields below - or fill them in manually. 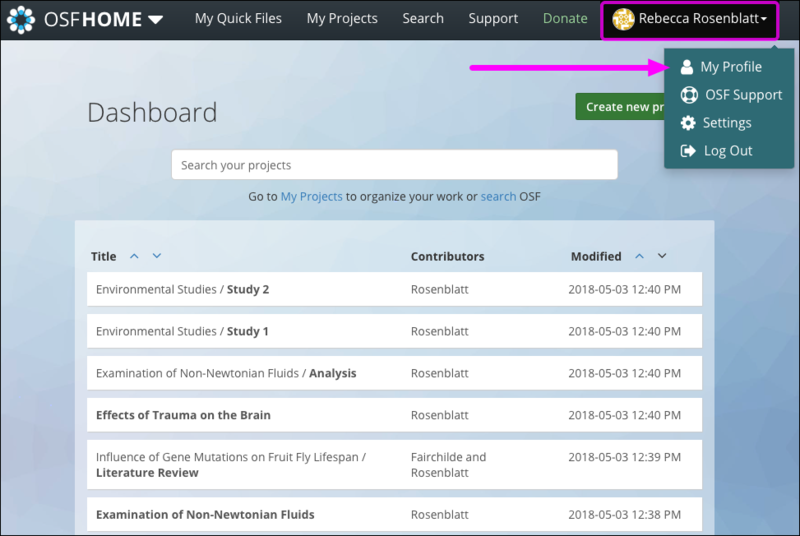 The second group of name fields is used in the pre-formatted citations that appear on "Project Overview" and "Component Overview" pages. When you're finished filling out these fields, click Save to save your changes or Discard changes if you don't wish to update your name. Click the Social tab at the top of the "Profile information" page. The "Social" page shows social media information. Here you can enter links to your accounts on many social media platforms and to your personal websites. To enter your personal websites, type the full URL into the textbox below "Your websites." For the other social links, you don't need to type the full URL - just your profile ID. When you're finished filling out these fields, click Save to save your changes or Discard changes if you don't wish to update or provide your social information. Click the Employment tab on the "Profile information" page. The "Employment" page shows employment information. 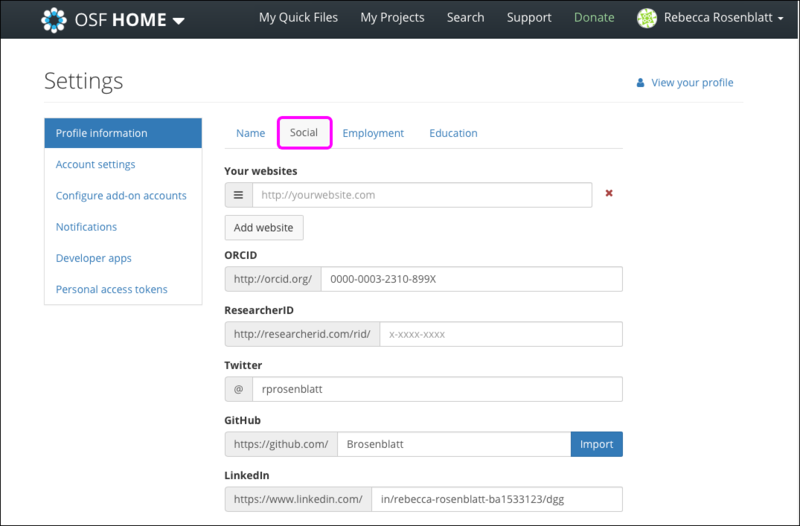 By default, one employer is displayed, but you can add more by clicking the Add another button. Include information such as department, title, start and end date. 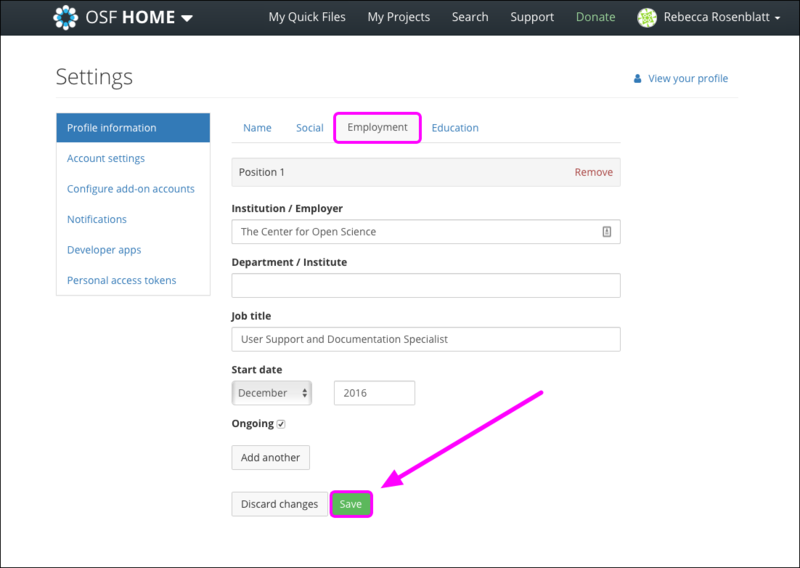 You can reorder employers by clicking and dragging them into the desired order. 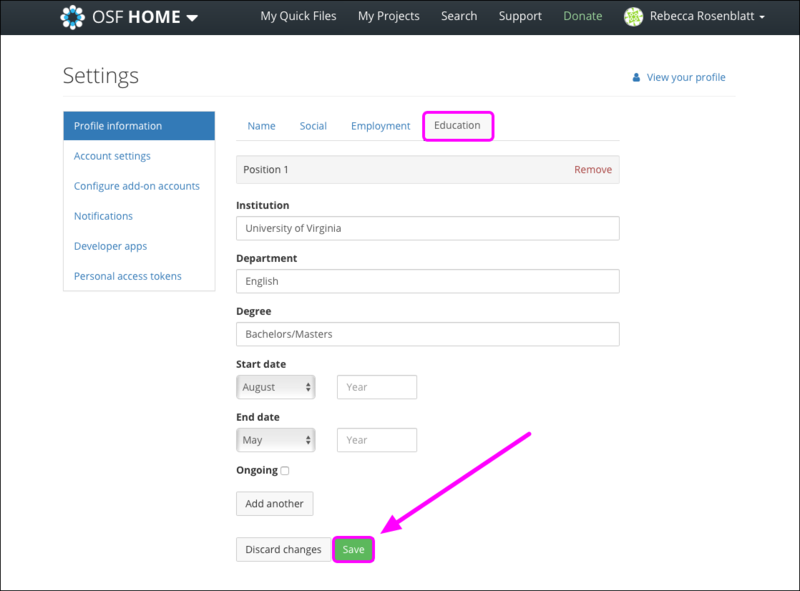 When you're finished filling out these fields, click Save to save your changes or Discard changes if you don't wish to update or provide your employment information. Click the Education tab on the "Profile information" page. The "Education" page shows your education history. 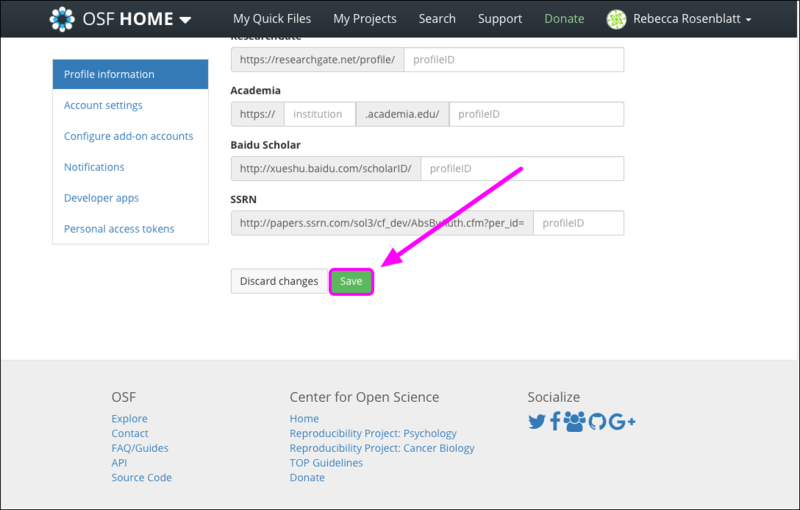 You can add multiple institutions by clicking the Add another button. You can reorder the institutions by dragging and dropping them into the desired order. When you're finished filling out these fields, click Save to save your changes or Discard changes if you don't wish to update or provide your education information.